The truth of the matter could not be more different from what the noisy naysayers maintain . . ..
• Hydrocephaly is a condition whereby there is an abnormal accumulation of cerebrospinal fluid in the ventricles of the brain causing bulbous enlargement of the skull. The treatment is to use a cerebral shunt to regulate amount, flow direction and pressure of the fluid. However, there are two things that must be understood. According to the journal Annual Review of Hydrocephalus, the long-term survival of hydrocephalics before 1960 (the year shunts were introduced as a treatment) was exceedingly low. Dr. Spyros Sgourus says that there was “high morbidity and mortality associated with treatment of hydrocephalus in the 1930s and 1940s.” According to the Review, in the 1940s, before shunting was established, infants with hydrocephalus had a very poor prognosis for survival. The fact is that the being pictured in the slides is between 3.5-4.0 feet tall and because of this is not a hydrocephalic infant. The skirted female legs (stocky like Hilda Ray) shown in the slide give us a very good sense of the length of the being she is looking at. • Clear versions of the slides depict a being whose anatomy does not correspond to a human being. The limbs (legs and arms) are exceeding thin, frail and fragile, characteristics that are not associated with hydrocephalus. In fact, the torso (which has been opened) and rest of the body look nothing like any known case of hydrocephalus in history. The skull too, is enlarged but not ‘bulbous’ which is characteristic of non-shunted hydrocephalics. • The being’s head is severed from the body (not evident in the screen grab) and one eye is missing. The chest and the abdominal cavity are missing. Hydrocephalic corpses are kept intact in medical study and display. • The being has no teeth and has wide-set eyes. Lack of teeth and wide set eyes are not known to be conditions associated with hydrocephaly. • In the actual slides it is evident that the being has only four fingers. To my knowledge, mummies and hydrocephalics are not typically missing a fifth digit. • A detail not known or revealed to anyone but those who have seen the slides is that close-ups of the being’s face show a very ‘pointed’ chin, a chin that in no way resembles a human, mummified or hydrocephalic. In fact, the facial features do not in any way match that of other known hydrocephalics or mummies. • One commenter (Gilles Fernandes) has shown a side-by-side comparison of the video grabbed slide and an infant mummy. He circles the feet of both, making a comparison and implying that they are one and the same. However, the image Mr. Fernandes offers is that of a specimen who is far, far shorter than 3.5-4.0 tall. And what is depicted in the slide is not a foot at all, but something else, perhaps a piece of debris lying on the surface. The being’s feet actually end behind the placard. In the actual slide there is even another similar, smaller such item which can be seen. 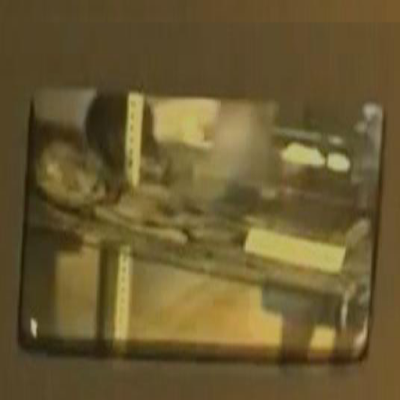 • This ‘placard’ is not very evident in the video grab image. However, it has been enlarged by experts and the writing, in red ink, is handwritten, not typed, as would be found in a biological display in a museum. • Most importantly, the placard, as well as the support structure that the being rests upon, are clearly ‘temporary.’ The structure looks very make-shift, resembling a quickly-assembled ‘erector set’ type deal, with beams that have ratchet holes in them. The set-up in no way whatsoever resembles that of a professional museum display. It is not a well-crafted, pristine glass museum display box, but something not meant to be at all permanent. There is also a military-green blanket upon which the being rests, atypical of any such museum display of other biological specimens. • Mummies are desiccated. This being was obviously either recently alive before the fatal pictures were taken, or had been embalmed. • The Rays hid these two slides away and separate from the other slides found in a chest and were only discovered by the owners much later, as if to indicate that these two slides held special importance and meaning. • This author had his computer system hacked in an attempt to gain more information about the slides, or perhaps to obtain the slides themselves. • Other researchers including Nick Redfern and Tom Carey (who had his stored documents ‘crypto-locked’ with malware) were also hacked. • Some people began contacting -or threatened to contact- involved photo scientists and witnesses (including a 90 year old man) in an effort to either gain more information or to derail the investigation. • Money was stolen from my credit card account in a ‘skimming’ scheme resulting from the hack of my computer system. Bank investigators are currently engaged in resolving this. • Accusations of hoax were made even before any release of any type of the slides. I was directly accused of being ‘a liar’ and other defamatory and legally-actionable comments were made against me and my reputation. • Phone calls were placed to me in the wee hours by blocked callers who threatened me with ‘exposure’ as a fraud and my family members have even been harassed. • Some have recently blogged accusing investigators of “pretending” to be hacked to build publicity and mystery. Falsely reporting that a crime has been committed (charges have been filed with the FBI) is a federal offense.